For over 40 years, the Southwestern Mission Research Center has supported a variety of Spanish Borderlands research and education projects. Proceeds from our educational mission tours enable us to sponsor scholarship on a broader level. We assist with publications and promote education. Most of all we engage in cooperative restoration projects with the mission communities. Below is more information on our conservation, publication, and research activities. In 2008, SMRC provided a $2,500 grant to the Tubutama community to replace the church doors after the old doors were determined to be beyond repair and a security risk for the entire church. 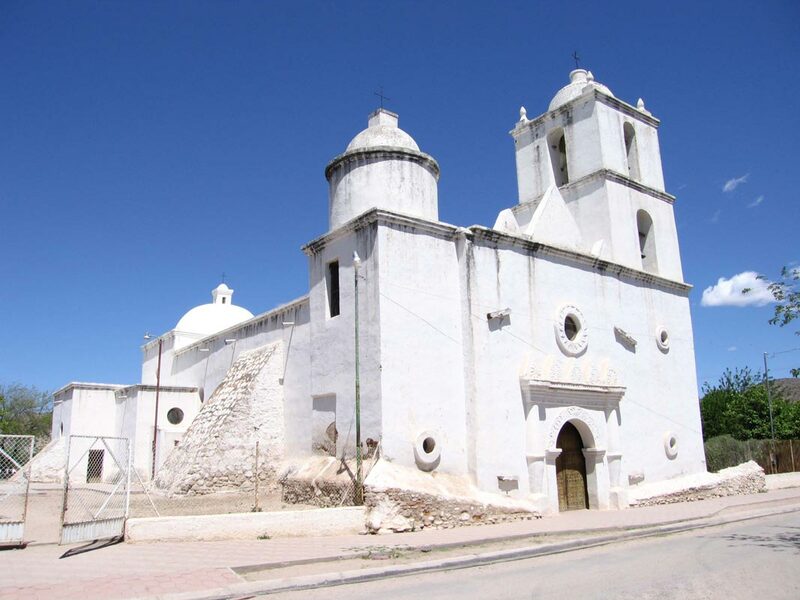 From 1993 through 2001, SMRC provided both financial and technical assistance for preservation work at San Ignacio. 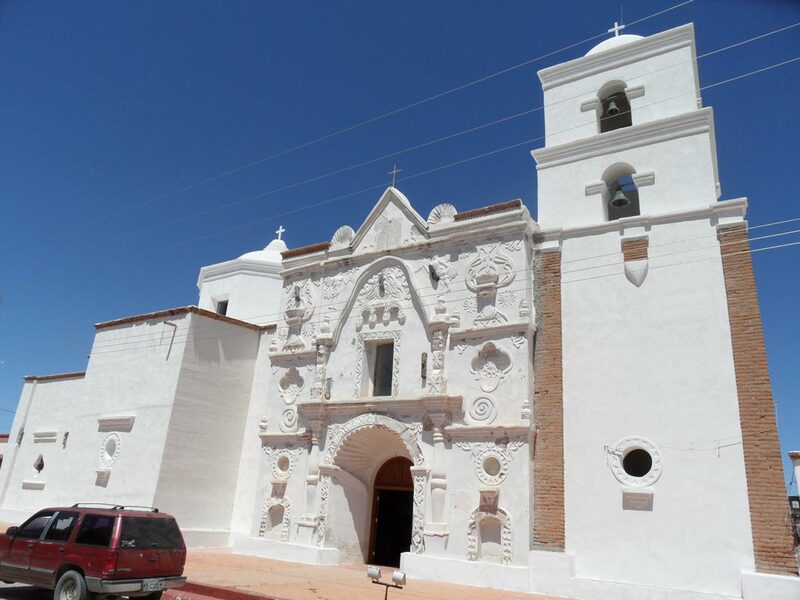 This included construction of a French drain along both the interior and exterior of the mission’s foundation; repainting the barrel vault and dome; and mitigation of adobe salt efflorescence. In 1998 and 2000, SMRC provided a total of $5,000 in support of international cooperative work at Cocospera. 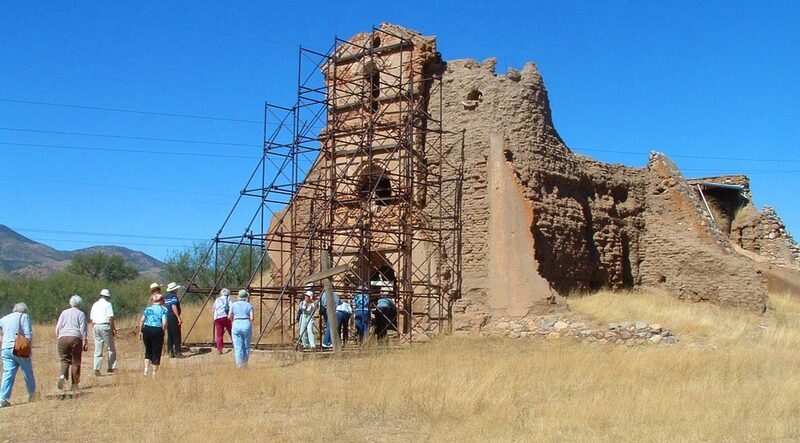 These funds helped in the development of a strategic plan for preservation; emergency stabilization; adobe wall erosion repair; temporary support for the principal altar; a temporary roof to protect the altar area; plaster restoration and conservation; and test excavations. 2017 Bleser, Nicholas. Tumacacóri: From Ranchería to National Park. Southwestern Mission Research Center, Tucson. 2015 Fontana, Bernard L. San Xavier del Bac: Portrait of a Desert Church. Southwestern Mission Research Center, Tucson. 2014 Steffan, Jack (Jacqueline). Padre Kino and the Trail to the Pacific. Kino Heritage Society, Tucson. 2013 Kessell, John L., Miera y Pacheco: A Renaissance Spaniard in Eighteenth-Century New Mexico. University of Oklahoma Press, Norman. 2010 Fontana, Bernard L., photographs by Edward McCain, A Gift of Angels: The Art of Mission San Xavier del Bac. University of Arizona Press, Tucson. 2009 Chana, Leonard, Susan Lobo, and Barbara Chana, The Sweet Smell of Home: The Life and Art of Leonard F. Chana. University of Arizona Press, Tucson. 2008 Lewis, Elizabeth Bruening, The Twilight of the First Millennium—Light on the Dark Ages. Dromedary Press, Phoenix, Arizona. 2007 Giffords, Gloria Fraser, Sanctuaries of Earth, Stone, and Light: The Churches of Northern New Spain, 1530–1821. University of Arizona Press, Tucson. 2006 Sheridan, Thomas E., Landscapes of Fraud: Mission Tumacácori, the Baca Float, and the Betrayal of the O’odham. University of Arizona Press, Tucson. 2002 Kessell, John L., Spain in the Southwest. University of Oklahoma Press, Norman. 2001 Brown, Alan K., A Description of Distant Roads: Original Journals of the First Expedition into California, 1769–1770, by Juan Crespi. San Diego State University Press, San Diego. 2001 Flint, Richard, Great Cruelties Have Been Reported: The 1544 Investigation of the Coronado Expedition. Texas A&M University Press, College Station. 1999 Pérez de Ribas, Andrés, History of the Triumphs of Our Holy Faith amongst the Most Barbarous and Fierce Peoples of the New World, translated by Daniel T. Reff, Maureen Ahern, and Richard K. Danford. University of Arizona Press, Tucson. 1998 Olvera H., Jorge, Finding Father Kino: the Discovery of the Remains of Father Eusebio Francisco Kino, S.J., 1965–1966. SMRC, Tucson. 1997 McCarty, Kieran, A Frontier Documentary: Sonora and Tucson, 1821–1848. University of Arizona Press, Tucson. 1997 Officer, James E., Mardith K. Schuetz-Miller, and Bernard L. Fontana (editors), The Pimeria Alta: Missions and More. 1st and 2nd printings, SMRC, Tucson. 1996 Sheridan, Thomas E., and Nancy J. Parezo (editors), Paths of Life: American Indians of the Southwest and Northern Mexico. University of Arizona Press, Tucson. 1995 Miller, Mardith K., Buildings and Builders in Hispanic California, 1769–1850. SMRC, Tucson, and Santa Barbara Trust for Historic Preservation, Santa Barbara. 1994 Crosby, Harry W., Antigua California: Mission and Colony on the Peninsular Frontier, 1697–1768. University of New Mexico Press, Albuquerque. 1994 Santiago, Mark, The Red Captain: The Life of Hugo O’Conor, Commandant Inspector of the Interior Provinces of New Spain. Arizona Historical Society, Tucson. 1974 Ahlborn, Richard E., Saints of San Xavier. Southwestern Mission Research Center, Tucson. Since 1992, the Southwestern Mission Research Center has provided financial assistance for a variety of research projects undertaken by the University of Arizona Office of Ethnohistorical Research (formerly known as Documentary Relations of the Southwest). Other past research projects include support for the Gran Quivira Conference, as well as research focused on the Tucson Presidio and the San Xavier mission.